These AGV Automated Guided Vehicle Castors are supplied with Electro Conductive Polyurethane Wheels with Stainless Steel Castor housing ideal for corrosion free long life in hospitals, food manufacturing plants and automated production lines. 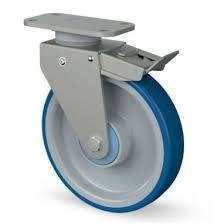 The Electro Conductive Wheels suitable for sensitive applications where electric charge may damage equipment. These self aligning castors are ideal for towing carts and trolleys as they prevent impact on walls and equipment and avoid the side to side swerve. Tow these castors round a corner and the integral self positioning snaps the caster wheel back into fixed position. Ingenious self aligning castors and self aligning wheels to maintain control of your production line trolleys.